This interview was conducted via e-mail by Lead Interview Editor Addison Rizer. Of the process she said, “Nicole Sealey’s Ordinary Beast explores identity and race in modern America through strong imagery and surprising lyrical lines. Many of these poems will stay with me forever.” In this interview Nicole Sealey talks about self-definition, editorial power, and sharing her writing process. Superstition Review: Nicole, thank you so much for agreeing to do this interview. I so enjoyed your exploration of identity and self-definition in your book, Ordinary Beast. One line that has been ringing through my head for days is, “You want me to say who I am and all of that” from the poem “legendary.” Can you talk about the role of self-definition in identity? 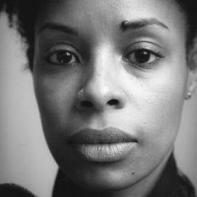 Nicole Sealey: Of course, thank you for your kind words as well as for this opportunity to talk poetry. I can’t take credit for the line you note, which is a quote by Pepper LaBeija, the late African American female impersonator featured in the documentary film Paris Is Burning. As you know, the line is the epigraph for one of the “legendary” poems in Ordinary Beast. In the film, LaBeija is, I believe, somewhat taken aback by the question itself because it is seldom asked. Mostly, we are all ascribed an identity and, subsequently, buy into that identity to varying degrees. Self-definition, then, isn’t so much defining who we are as it is defining who we are not. SR: I think I, too, would be taken aback at a question like that. You say we’re “ascribed” an identity. Can you talk about who ascribes this identity to us? Why do you think self-definition is more about deciding who we aren’t than who we are? NS: It’s less of a who and more of a what. Even so, identity isn’t the issue. The issue is this: the attributes assigned to each are inspired by white supremacy, so we must actively resist such impositions and then decide for ourselves who we are. SR: Throughout the collection, there are quite a few moments of acknowledgement of the reader, or at the very least the narrator shows an awareness that someone is listening. The narrator from “Happy Birthday to Me” says, “What was I saying – oh yes,” and “in defense of ‘candelabra with heads,’” the “dear reader” is invoked. What triggers these episilatory moments for you? Are they stylistic or do they play a larger role in the collection? NS: Both. Acknowledging the reader is definitely a technical device to keep the reader engaged. Also, I imagine Ordinary Beast as a conversation between the reader and myself. Why not talk directly with readers? That’s the very least I can do as an active participant in said conversation. Part of the pleasure I take in being a writer and reader of poetry is this kind of instant intimacy, wherein the reader and the writer are (for a few minutes, hours, days or weeks) in it together. SR: I also noticed a sort of communication between your poems themselves, for instance between “candelabra with heads” and “in defense of ‘candelabra with heads.’” Can you talk about why you circle back and respond to poems that appear earlier in the collection? NS: As you probably know, “in defense of ‘candelabra with heads’” was written in response to an editorial decision I’d made at the suggestion of poets whom I greatly respect. In my chapbook, The Animal After Whom Other Animals Are Named, the edited version of “candelabra with heads” appears, sans the last line: ‘Who can see this and not see lynchings?’ The original version however, which includes the question in question, speaks most honestly to my intent and the poem’s natural unfolding. SR: The original version of the poem, in contrast with the edited version, shows how much the editing process can change a poem. Can you talk about having more editorial control over Ordinary Beast, and how it changed the poetry in the collection? NS: To be fair, I had editorial control over both projects. With The Animal, however, I didn’t exert that control because I wasn’t yet comfortable with such power. Had I resisted loosing the line, had I pleaded my case, I’m sure the editors would have understood and backed me up. But, I was new to it all and didn’t quite understand the process—I didn’t understand that their suggestions were, in fact, suggestions and not directives. With Ordinary Beast I owned my power and gave in to all of my editorial impulses. SR: In “underperforming sonnet overperforming,” the poem’s last lines served as a revelation for me: “this poem is, with enormous success/the only poem entirely imageless.” It made me immediately flip back and read the poem all over again with the last line in mind. Where did this idea of the imageless poem come from? What drives an imageless poem? NS: “underperforming sonnet overperforming” is an ars poetica, a poem that examines the art of poetry. The poem is exploring ending with an image as a hard-and-fast rule in poetry. Like “in defense of ‘candelabra with heads,’” “underperforming sonnet overperforming” is questioning ideas of what a poem should and should not do. What specifically drove this somewhat imageless poem? Music, mostly. SR: How fascinating to hear that music drove this imageless poem. How, specifically, did music inspire this? NS: We each have our own unique, inherent music. “underperforming sonnet overperforming” moves to mine. Though I can’t place it, I know the sound because it turns up throughout the collection. SR: In an interview with MFA Day Job, you said you’d tell yourself to focus on writing poems with the “capacity to endure” if you could tell your younger self anything. What characteristics do you think such poems have? NS: Poems with the “capacity to endure” are beauty-filled and urgent. SR: Can you tell us more about what makes a poem urgent for you? NS: Chilean poet Rosabetty Muñoz wrote, “Urgent poetry: it corresponds with those rare moments of lucidity, alone, when one and alone we succeed in taking the thread that binds us all, those of before, those of now, those that will come. To account for those brief flashes and let them flow is urgent.” Yes, those fluid brief flashes. SR: I love that on your Instagram, you share rough drafts of your poems. Can you talk about why you share these parts of the writing process? 1. To celebrate drafts that made finished poems possible. 2. To remind myself as much as others that writing poems is difficult work but, despite this, we write anyway. 3. Because writing can be lonely and, for whatever reason, sharing drafts makes it less so. SR: This sharing of your drafts speaks to your idea of a conversation between reader and writer as well. How might sharing drafts change the conversation that a published poem might have with a reader? NS: A published poem is, for the lack of a better word, finished. Drafts, poems in progress, trace both direction and potentiality. That said, sharing drafts with readers expands the conversation about published work to include not only what is but also what could have been and what still might be. NS: They say, “A clean house is a sign of a wasted life.” If this is also true of writing spaces, let’s just say my life is very fulfilled.